You know how cucumbers soothe and refresh tired, sallow skin? 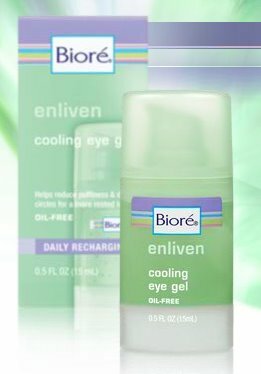 Well, there's no need to head to the grocery store anymore -- because with Biore Enliven Cooling Eye Gel in your vanity, your eyes no longer need that green vegetable. Puffiness? Gone. Dark circles? Nonexistent. Seriously, this is a true miracle worker. The name itself doesn't lie -- this stuff is truly cooling and leaves the under-eye area feeling totally refreshed. A mixture of golden root, yeast and sugar beets make up the clathrate moisture matrix, which works to -- you guessed it -- de-puff and brighten! And holy smokes, cucumber extract refreshes and calms.